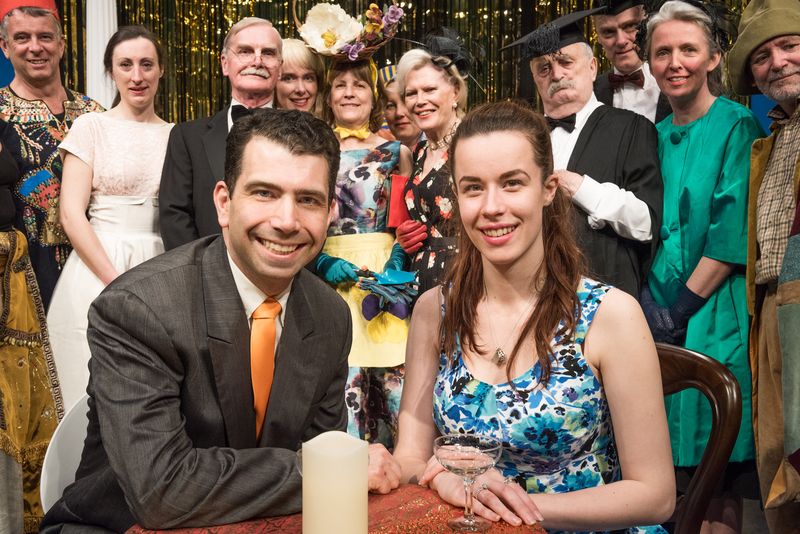 Stephanie Potts and Terry D’Onofrio combine well as the couple, eagerly accepting payment for looking after a piano, but Dorothy Reynolds and Julian Slade’s witty musical comedy contains numerous opportunities for the supporting cast to shine. Brian Waddingham plays three diverse roles, with his dancing Police Inspector the pick, duetting hilariously with John Jenner as Constable Boot. The audience particularly enjoyed the humour of Jackie Pilkington’s beauty-parlour scene (as Lady Raeburn) as well as David Rhodes’s Cleopatra and Rowena Greenaway’s Asphynxia. Director Camilla Burgess should be proud of her talented cast (too many to mention) and production team, with nice sets and props (including the piano) and Ute Schwarting’s piano accompaniment. A delightful evening! thank you Studio Theatre Company for bringing [Salad Days] back, with all its naivety and charm, so that we can enjoy it all over again. The main strength of Camilla Burgess’ and Tamsin Jacson’s production is in the staging of the many musical ensemble numbers, both large and small. With a real sense of style and just enough choreography and imaginative business to keep us, the audience, visually entertained, the quality of the singing is never compromised and the all-important lyrics come through with clarity and precision. In the leading roles of Jane and Timothy, Stephanie Potts and Terry D’Onofrio, who are both making their debut with Studio Theatre, make a delightful couple. Full of youthful optimism and wide-eyed innocence, their singing was absolutely lovely and their dancing pretty decent too. Stephanie Potts’ rendition of I Sit in the Sun in particular was quite enchanting while Terry D’Onofrio’s general boyishness and effortless harmony singing was spot on. Their duet together, We Said We Wouldn’t Look Back, was an early highlight of the evening. The third pair of lovers, Rowena, the hapless shop assistant from Gusset Creations, and PC Boot were beautifully played by Tamsin Jacson and John Jenner. Again, both familiar figures in Studio Theatre productions, they gave a couple of sparkling performances. As the two mothers, Christina Reynolds (Timothy’s mother) and Jackie Pilkington (Lady Raeburn – Jane’s mother) clearly enjoyed the opportunity of playing their larger-than-life characters. Nevertheless, their Act II duet We Don’t Understand Our Children ‘a song that surely ought to be better known’ was really quite poignant. In contrast, the beauty parlour scene early on in Act I was wonderfully funny, and possibly not too far from reality, the snobbish and utterly self-obsessed Lady Raeburn indulging in her various treatments whilst engaged in private conversations on the telephone as though the beauticians themselves were not there. In the supporting roles, Fabia Alexander captured the stylised mannerisms of Troppo the Clown very nicely, while David Rhodes as the Nightclub Manager and Rowena Greenaway as the cabaret artist Asphynxia provided two of the evening’s many highlights with their respective songs Cleopatra and Sand in My Eyes which open Act II. Salad Days is, however, essentially an ensemble piece, and there is simply not the space to acknowledge everyone. Suffice to say all helped create that elusive feel good factor that was such a feature of the production, with, as is customary, most members of the cast taking on a variety of roles and throwing themselves into their various characters with evident enjoyment. The music itself was in the very capable hands of Ute Schwarting. A talented pianist and natural accompanist, and these are not the same thing by any means, she supported the singers without drowning them and helped the whole production run smoothly. Visually, things worked well too. The costumes were very stylish (lots of spots for the ladies of course) and the frequent set changes were seamlessly managed. The cut-out London skyline and colourful back lighting looked quite beautiful, and this coupled with the well-chosen props were really all that was needed to make the production flow. All credit to designer Alistair Faulkner and stage manager Jill Redston in this respect. This entry was posted on May 30, 2016 by salisbury_matt in reviews.